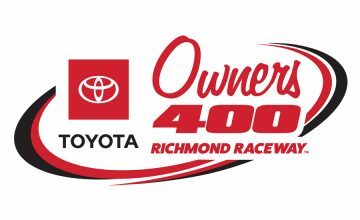 MARTINSVILLE, Va — Kyle Busch won the TruNorth Global 250 to claim his 201 career NASCAR national series win. He is now tied with Richard Petty for most national series wins. While many assumed he hit that mark last weekend at AutoClub Speedway, the unknown caveat is Petty’s one win in the NASCAR convertible series in 1959. Busch has won seven of the first 11 races he’s competed in this year. 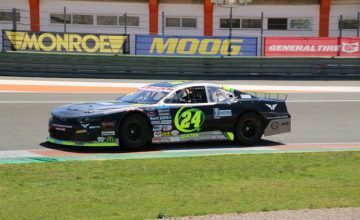 He says he’s “not exactly sure” if has been on such a hot streak before, but he did “remember there being a time when you used to be able to race for the championship in all three divisions. I led points across all three series early on in the season, I do remember that. Stewart Friesen, the pole-sitter, lead the way for the first 8 laps, but Kyle Busch went around him after five laps of side by side battling. Five laps later he had a full, one second lead over the race’s pole winner. Sheldon Creed started in the top-five but after 35 laps he was had a line of traffic behind him. Todd Gilliland, who was fifth at the time, give Creed a shot in the rear bumper entering turn-one. Creed slid up the race track, losing a handful of positions. Two laps later, Austin Hill gave him another scary moment during corner entry. Once again, Creed was pushed up the race track, opening the door for half a dozen trucks to get by him on the inside. On lap 64 Gus Dean’s OverkillRV.com Chevrolet caught fire after his engine expired down the front stretch. Dean climbed from his car under his own power and was OK. The caution lead directly into the first stage break. Kyle Busch led 62 of the opening 70 laps and won the stage, stealing a playoff point from NGOTS regulars. Austin Hill elected to stay on the race track during the stage caution. He was the only driver to attempt a one-stop strategy, but with no one else gambling with him he dropped outside of the top-three within the first couple of laps of the second stage. 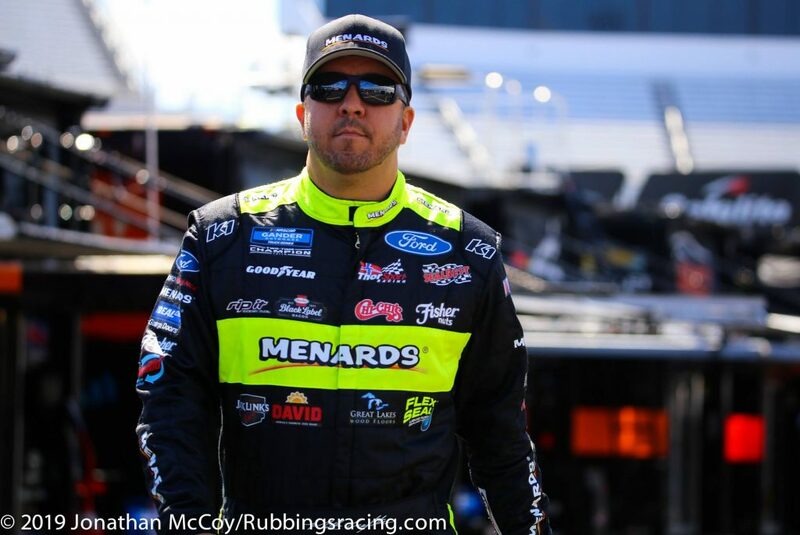 Matt Crafton had a rough Saturday afternoon on NASCAR’s oldest facility. Photo by Jonathan McCoy. Busch led the way from the onset of the second stage, but one driver was able to shadow him, Ross Chastain. Daniel Sasnett brought out a caution on lap 117 for a spin in turn-three. The majority of the lead lap cars came into the pits during this caution but two trucks stayed out, hoping to strategize into some points at the end of stage two. Friesen was one of those who stayed out, after a chaotic few corners he emerged as the clear-cut leader. Chastain ran him down on lap 130, and on the next lap Friesen let Chastain by, on his inside. With one lap left in the stage Ben Rhodes nudged by Friesen for second. Like usual, rubbing goes hand in hand with racing at Martinsville Speedway. Chastain won the stage, his first in the series. The battle with Busch was “awesome,” according to Chastain. “Obviously [Niece Motorsports] have some work to do to get [a win], and I do as well. “He took me to school on that second stage finish. I imagine he let us go and burn our stuff up a little bit. Just three laps later Sasnett spun in turn-four, bringing out the first caution of the final stage. One lap earlier Sauter cut down a left-rear tire in turn-two. The caution saved him from going more laps down. He was supposed to be the free pass during this caution but wasn’t awarded it because of a commitment box violation. The caution with about 60 to go set up a debacle for Chastain and Busch. The two dominated the first part of the race but after 50 laps of racing this put them in a bad position. 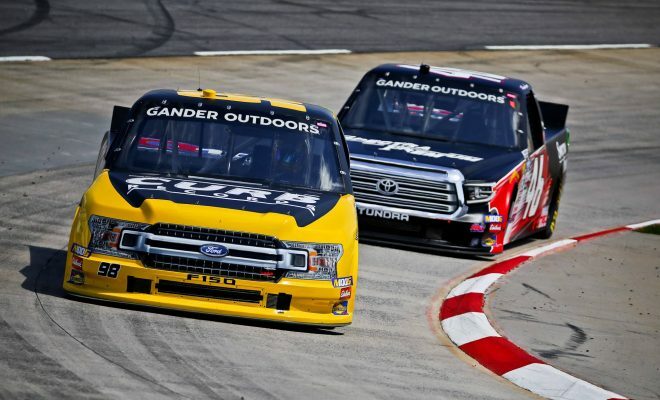 If they went in for tires the 18 trucks on the lead lap will stay out, if they go in for fresh Goodyear’s the rest of the lead lap will stay out. When the caution was over the majority of the leaders had stayed on the track. Busch cleared Chastain on the restart through turns one and two, but bumper’s were banging further back in the pack. Cory Roper spun his No. 04 Chevrolet in turns one and two with 40 laps to go. Sauter was the free pass this time around, but he had no tires left to mount on his No. 13 Chevrolet. Rhodes restarted second, on the outside of Busch. He and Busch got away cleanly while the rest of the top-10 banged doors, sorting themselves out. With 10 laps to go, Tyler Dippel spun out. While it looked like Busch was about to run away with his 201 win, he had to prove himself one last time. Not that this was going to stop Busch. He easily cleared Rhodes on the restart and sailed to his 201 win.